Joshua is so excited about basketball. He loves to watch the grown-ups playing on the court near our apartment. 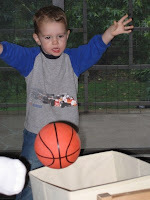 And he always wants to shoot hoops in the little kid's basket out at the playground. What he really needed was a way to enjoy this game on rainy days without buying an indoor basketball hoop. 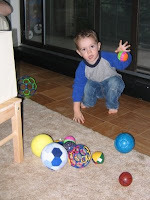 We gathered all the balls we have into a pile on the living room floor. Next we set a toy bin on one of Joshua's little chairs. What follows is a flurry of fun! 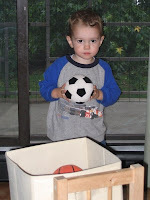 Joshua loves to shoot all different sizes of balls into the toy bin. Sometimes he is laughing too hard to even aim. So far, he only throws the balls at the basket... we may have a problem if he gets too excited and starts throwing them anytime at anything!